Fifty years ago today, the British Broadcasting Corporation's television channel BBC1 debuted the Beatles' first and only television movie Magical Mystery Tour. It was their first - and again, only - unqualified failure. Magical Mystery Tour was an experimental musical film that the Beatles wrote, produced and directed themselves, despite knowing next to nothing about making movies before this. It was in part a desire to express themselves on screen without the help of intermediaries like Richard Lester and Walter Shenson, the respective director and producer of their first two theatrically released movies. But it was also an earnest effort to explore artistic media other than records. It was Paul McCartney who first conceived the idea of the Beatles making a film for TV. Paul had been experimenting with film and had been making avant-garde shorts in his spare time, and he thought that it would be pretty cool for the Beatles to do something similar for the tube. Though John Lennon had his doubts, he was by no means averse to experimental cinema. He and friend and Beatles collaborator Victor Spinetti, who'd starred with the Beatles in A Hard Day's Night and Help!, sat through two successive screenings of the Luis Buñuel 1967 movie Belle De Jour checking out Buñuel's camera angles and use of color (and no doubt also checking out the film's star, Catherine Deneuve, but that's another issue). Besides, as John later remembered, the Beatles had given up touring and even one-night-only concerts, and "if stage shows were to be out, we wanted something to replace them. Television was the obvious answer." George Harrison and Ringo Starr were also game. So the plan preceded. 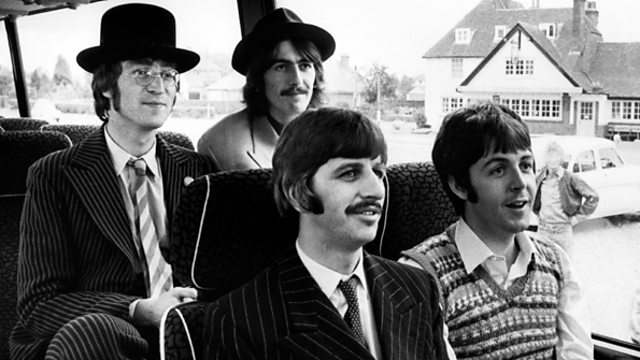 The premise of the film was based on the mystery tour, a popular diversion for the English working class at the time. The idea was simple; you got on a bus, you had no idea where you were going or what route you were taking, and you only found out were you were going once you got there. In the north of England, that usually meant taking a coach trip to the seaside resort of Blackpool, where tour goers would watch the city's annual light display and get drunk. But it was the antics of a group of American hippies that the Beatles hoped would provide the inspiration for the magic - Ken Kesey and his Merry Pranksters, who rode in a psychedelic-painted school bus drinking Kool-Aid spiked with LSD and recording their visions on the trip, a practice later documented by Tom Wolfe in his book "The Electric Kool-Aid Acid Test." 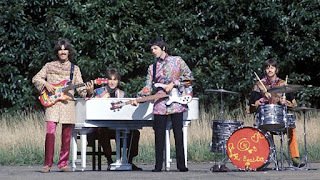 Paul McCartney hoped that the Beatles, all of whom were tripping on a regular basis in 1967, could capture on film the same sort of visions they captured in music. The film was to be aired during, believe it or not, Christmas time; the Beatles thought that Magical Mystery Tour could be a hip holiday special in contrast to the straight holiday fare that performers like Frank Sinatra and Bing Crosby had made for American television. It would be aired by the BBC on the day after Christmas, celebrated by the Brits as Boxing Day. The first Beatles project released after the death of Beatles manager Brian Epstein, Magical Mystery Tour was planned as soon as work on Sgt. Pepper was wrapping up. Paul wrote the title song in early 1967 and the Beatles recorded it that April. Work began on the soundtrack record in earnest in August 1967, just before Epstein's death; by a strange coincidence, Epstein attended a recording session for the soundtrack on Wednesday, August 23, that turned out to be the last Beatles recording session before his death on Sunday, August 27. Though Epstein would be in a cheerful mood a couple of days after the session in anticipation of his planned visit to America for the following month, he wasn't in good spirits that Wednesday night. It's as if he could see what was going to happen. There was no real script. The Beatles simply rented a bus, invited friends, actors, circus performers and a little girl named Nicola (now known as Nikki Hale and living in a Chicago suburb - really! ), and they all rode around Devon and Cornwall for two weeks in September 1967 filming as they went. Additional filming took place into October, and recording sessions for the songs in the film continued concurrently. 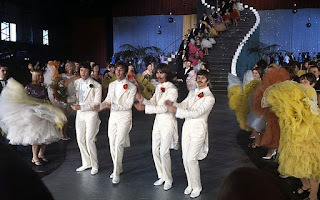 The ideas for the film ranged from John shoveling spaghetti on a plate in a restaurant (based on a dream he had) and Ringo driving the bus in a track race to the all of the passengers entering a pup tent at once and the male passengers stopping at a club to watch a woman strip while the Bonzo Dog Doo Dah Band perform a teen-tragedy parody song about a young woman who dies in a taxi crash, called "Death Cab For Cutie." (Yes, this is where that indie-rock band got its name.) Victor Spinetti got into the act by playing a drill sergeant trying to get the tour party to join the army. As you can gather, there was no plot and little suspense, unlike in A Hard Day's Night and Help! ; the group was improvising a basic trajectory from a beginning to an end. The songs in Magical Mystery Tour, meanwhile, are interspersed throughout as surreal vignettes ("I Am the Walrus" in a weird musical land of anthropomorphic creatures and city policemen all in a row, for example), with five magicians in the sky (played by the Beatles and Beatles assistant Mal Evans) directing the tour. It all ends with a Busby Berkeley-style sequence with the Beatles in white suits (below) performing "Your Mother Should Know." "We filled it in as we went along," John Lennon later said. "We knew most of the scenes we wanted to include, but we bent our ideas to fit the people concerned, once we got to know our cast. If somebody wanted to do something we hadn’t planned, they went ahead. If it worked, we kept it in." Magical Mystery Tour aired for the first time on BBC1 on Boxing Day, Tuesday, December 26, 1967, drawing fifteen million Britons - 27 percent of the British population at the time - to watch. The Beatles were hugely successful at getting people to tune in, but after 52 minutes of their self-indulgence and aimless camera and storyline experiments that seemed neither magical nor mysterious, the Brits turned off and dropped out. The following day, the Daily Express's television critic got front-page space for his review - "I cannot ever remember seeing such blatant rubbish." (To understand how devastating that is, just say "blatant rubbish" in a pompous British accent.) Other reviewers, none of whom obviously got to screen it in advance, called it "appalling," "chaotic," and "a colossal conceit." The band Traffic - which actually filmed a sequence for the movie - could breathe a collective sigh of relief knowing that they'd been edited out of it. To be fair, the film was aired on the wrong channel. 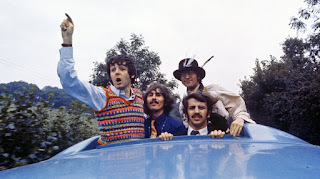 Magical Mystery Tour's raison d'etre was the Beatles' use of color, in all of its forms; the sequence for their instrumental "Flying," the first of only a few original compositions credited to all four Beatles, was presented with colorized images of clouds from a black-and-white Stanley Kubrick film. Ironically, TV viewers could only see them in black-and-white - BBC1 didn't broadcast in color at the time. Magical Mystery Tour was aired on the color channel BBC2 on January 5, 1968, but between the day after Christmas and the eve of the Feast of the Epiphany, the Brits had already abandoned the idea of giving Magical Mystery Tour a second chance. An American TV deal was cancelled on the basis of the reaction to the British airing, so Magical Mystery Tour became the musical equivalent of Cuban cigars in the United States - forbidden fruit, something so rare and unattainable that you had to seek it out for yourself. Unlike Cuban cigars, which have a stellar reputation, Magical Mystery Tour had such a bad reputation that Americans seeking it out went in to it with low expectations, anticipating that it would be bad but also asking how bad it could possibly be. It became a cult item, first being shown twice at the Fillmore East in New York in 1968, later being given limited theatrical release in the seventies and then occasionally popping up at 1:30 in the morning on local TV. Many American Beatles fans come away from Magical Mystery Tour with a different appraisal than their British counterparts - yes, it's bad, but it's not horrible enough to warrant all the criticism it got from British audiences back in 1967. Americans see it in ironic terms - it's so bad, it's good. Some Americans have even come away from it with a sense of sincere appreciation; Steven Spielberg has praised the camera angles and use of color in the movie, and he cites it as an influence. Magical Mystery Tour's very elusiveness in These States has allowed the film to hold up better in the U.S. than it did in the U.K., where its failure with the press and the public led Paul McCartney to admit that "we goofed really." As it turned out, those foolish Beatles on the hill proved to be wiser than those who scorned them. Magical Mystery Tour actually broke new ground for rock and roll, as other rockers took this sad song of an idea and, well, made it better. The following year, 1968, the Monkees made the trippy theatrical movie Head; ironically, fans and critics consider this Magical Mystery Tour copy from the prefabricated Beatles copycats to be the superior movie. Also in 1968, the one man who inspired the Beatles more than any other, Elvis Presley, made the definitive rock and roll Christmas special, aired on NBC that December 3. So even in failure, the Beatles succeeded. Magical Mystery Tour was finally aired on American national television on December 14, 2012, on PBS, the closest thing the United States has to the BBC, with a documentary on the making of the film preceding it.